The global DIY home automation market is expected to reach USD 21.30 Billion by 2020 at a CAGR 37.9% between 2015 and 2020. The Americas and Europe held the major share of the market, whereas APAC is the fastest growing region. The DIY home automation market is driven by the increasing demand of energy efficient solutions and the rising security concerns. 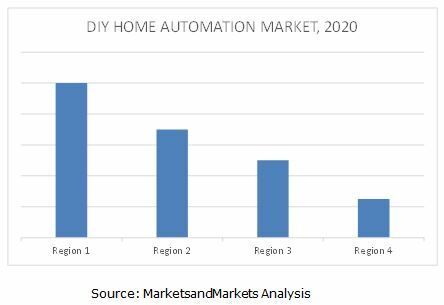 The growth opportunities in the DIY home automation market are being witnessed due to the increasing adoption of automated services, government incentives for green initiatives, and the lower cost of DIY systems compared to professionally installed systems. This research study involved the extensive usage of secondary sources to identify and collect information useful for this technical, market-oriented, and commercial study of the DIY home automation market. The primary sources are mainly several industry experts from core and related industries and preferred suppliers, manufacturers, distributors, service providers, reimbursement providers, technology developers, alliances, standards and certification organizations from companies, and organizations related to all the segments of this industry’s value chain. In-depth interviews were conducted with various primary respondents that include key industry participants, subject matter experts (SMEs), C-level executives of key market players, and industry consultants among other experts to obtain and verify critical qualitative and quantitative information as well as to assess future prospects. The industry ecosystem of the DIY home automation market includes raw material and manufacturing equipment suppliers, electronic design automation (EDA) and design tool vendors, integrated device manufacturers (IDMs), DIY home automation market players, DIY home automation intellectual property players, DIY home automation technology platform developers, DIY home automation semiconductor device manufacturers, DIY home automation end-point manufacturers, DIY home automation product manufacturers (ODMs), DIY home automation original equipment manufacturers (OEMs), ODM and OEM technology solution providers, assembly, testing, distributors, and end-user segment. The global DIY home automation market by offerings is categorized into hardware and managed services. The hardware category is further segmented into various products such as smart hubs, security & access control, lighting control entertainment control, climate control, and other appliances. The global DIY home automation market by technology is categorized into various technologies such as network technologies, wireless technologies, and other protocols & standards. Geographical analysis covers Americas, Europe, Asia-Pacific, and the RoW. DIY home automation market is expected to grow at a CAGR of 37.9% between 2015 and 2020. An automated home provides numerous benefits to the end-user such as reduced energy spending, security from theft, convenience, comfort, better connectivity, and protection from unauthorized access to a home. Security and energy management have become the key drivers for the potential growth and adoption of the DIY home automation systems. Earlier, the reconstruction or renovation of homes was required in order to ‘automate’ them; this can now easily be avoided by using wireless technologies. Wireless technologies not only help to avoid reconstruction but also ensure easy and self-installation as they eliminate the usage of wires. The market for security & access control is expected to grow at a rapid pace because of increasing desire of the consumer for convenience, and connectivity safety & security. Installing a home security & access control system with professionally installed systems is expensive as professionals are required to install the system, long-term contract and monthly payment needs to be signed in order to keep the system running. Now, many DIY-friendly devices and sensors have come to the market which work with smartphone and other portable devices. These systems come with no contracts, and in many cases with no monthly fees. The U.S. and Canada are expected to be the major drivers for the growth of the DIY home automation market in North America because of the presence of various major market players such as Smartlabs, Inc. (U.S.), Nortek, Inc. (U.S.), and Nestlabs, Inc. (U.S.) among others, thereby making the region more lucrative for the DIY home automation market. The demand for energy management coupled with the increasing demand for green homes has resulted in the growth of the North American market. Currently, there are no standard guidelines for developers as well as buyers on the minimum required features in a DIY home automation system. Buyers are not aware of the basic features available in a DIY home automation system. The availability of numerous proprietary DIY home automation systems in the market makes system integration difficult, especially, when different systems are used. This restraint has a high impact, currently, which would reduce in the long run.